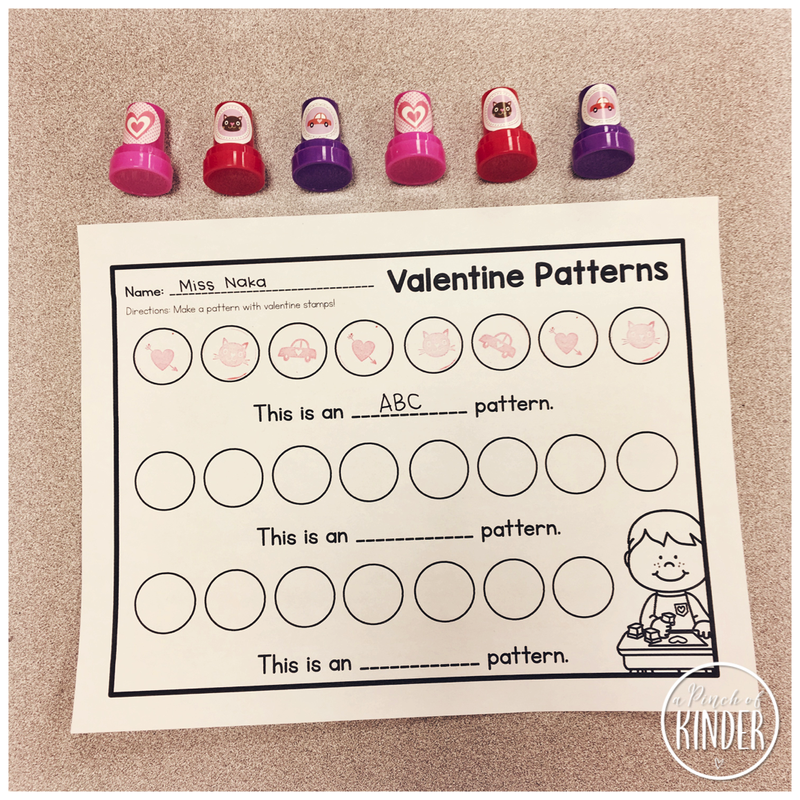 Today I wanted to share with you some Valentine's Day themed activities we have been exploring! I hope you can use some of them next week! A twist on an oldie but a goodie. I just twisted pipe cleaners to make a loop on one end and then formed the loop into hearts. 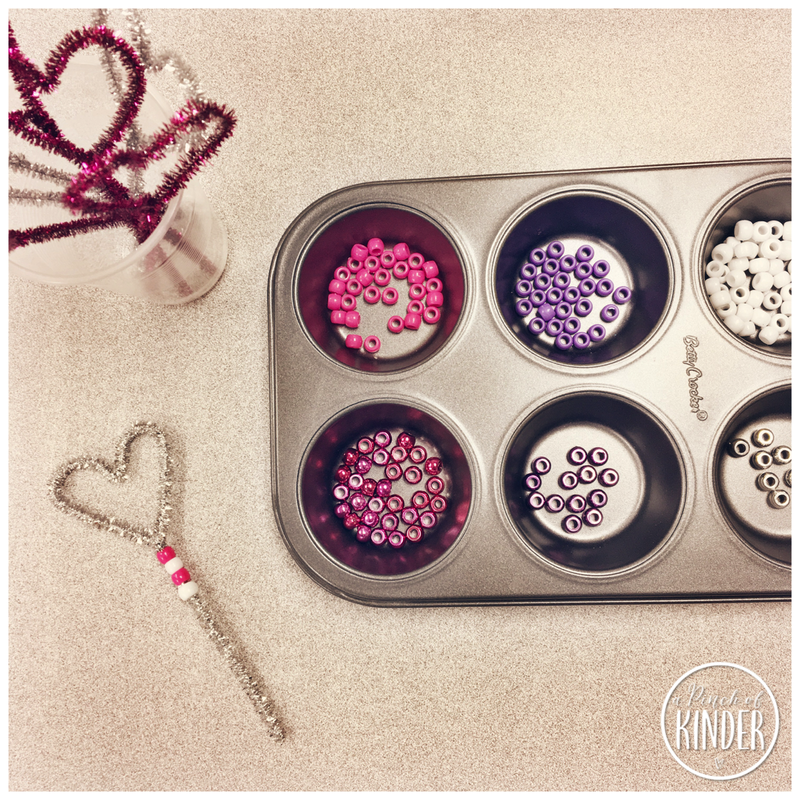 Then I set them out with some white, purple and pink pipe cleaners and had the students make patterns on them. Water beads are so fun! I wanted to find a way to make them more than just sensory play so we made up two math activities with them. 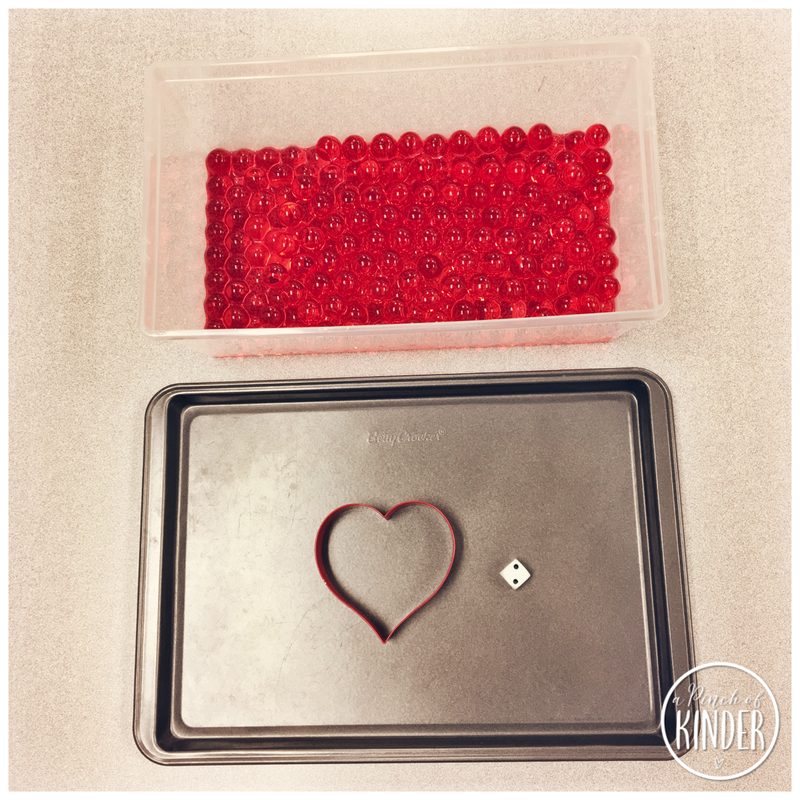 For this first one we had the students roll the dice and put that many water beads in the heart. They keep rolling until the heart is full. This activity works on one to one correspondence, subitizing and exposure to the concept of area. 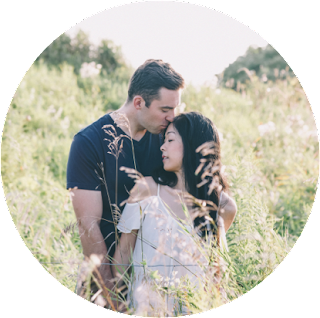 Another option was to have a race with a friend, taking turns rolling the dice and seeing who filled their hearts first. At this activity, I wrote some numbers on the lids of these heart containers and we had the kids scoop that many water beads into the containers. This activity works on numeral identification, one to one correspondence and creating sets. Simple but always a hit! The kids decorated their hearts, made heart monsters etc. Open-ended play dough centres like this are great for oral language development, fine motor development and developing creativity! This week our close reading book was "Roses are Pink, Your Feet Really Stink" by Diane deGroat. 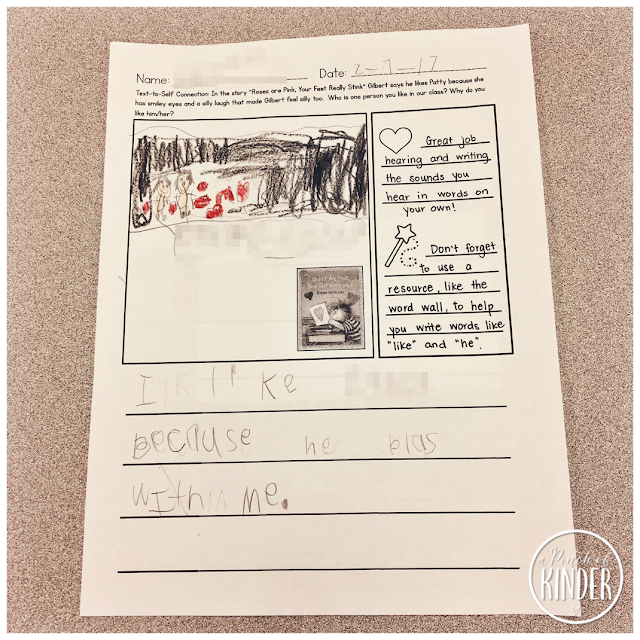 After we read the story we did this writing response! I'm seeing so much growth in writing recently which makes me so happy! If you're interested, you can find this writing sheet and many more in my Step by Step 3: Guided Writing & Assessments pack on TPT. Click here or on the image above if you are interested in checking it out! 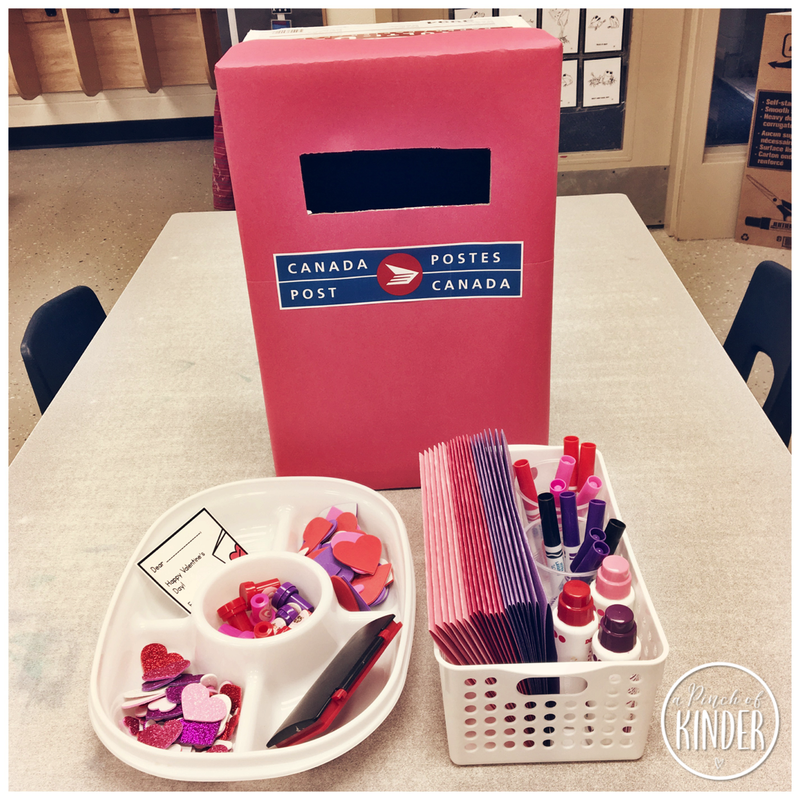 I was planning to put out a valentine card making centre out but then I saw this post by @kinder_owls on Instagram and knew I had to add a mailbox too! I just covered a copy paper box with red construction paper, added the Canada Post logo and cut out a slot. 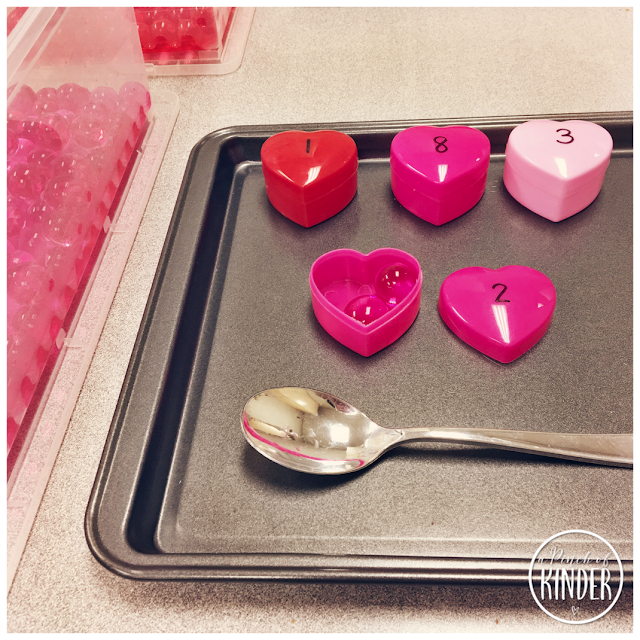 The materials I set out are foam sticker hearts, stamps and an ink pad, valentine card helper, a heart paper punch (not pictured), pink/purple/red construction paper folded in half, markers and bingo dabbers! The kids LOVED this centre. We open the box at the end of the day and let the kids read and hand out their valentines! 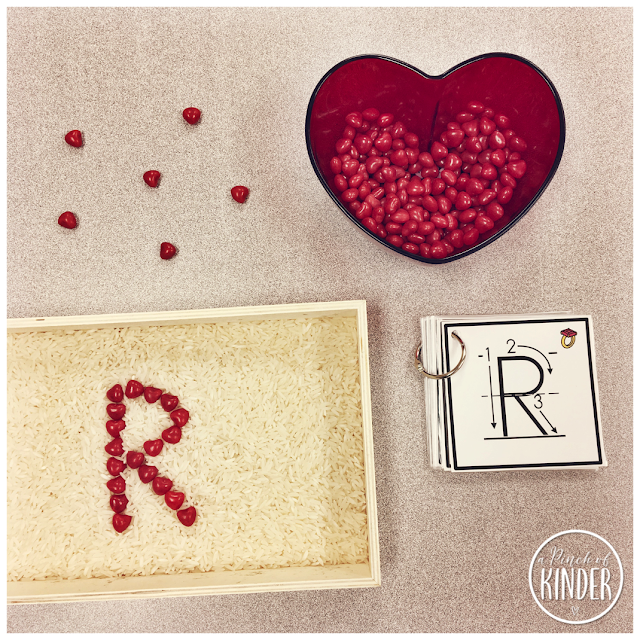 My teaching partner bought these cinnamon hearts and heart bowl so we set them out with our rice tray and letter formation cards and had them make letters with them! 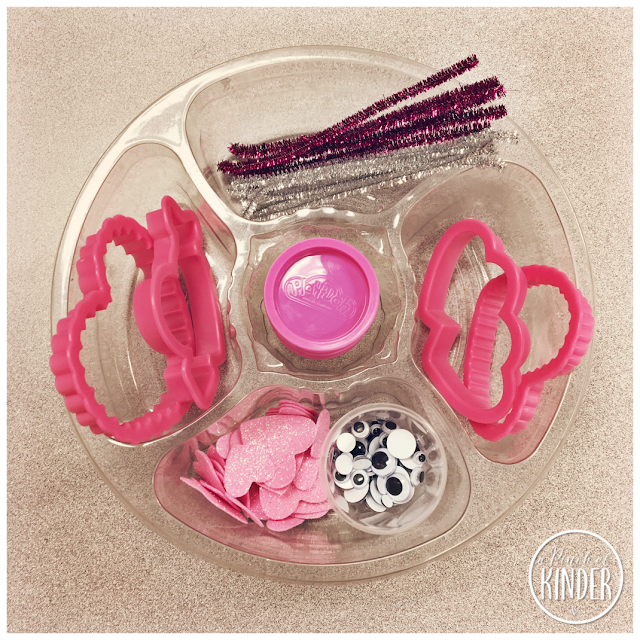 The cinnamon hearts are small and encourage pincer grip and fine motor development. You can grab these formation cards in both upper and lowercase by clicking here or on the image above. I bought these cute valentine stamps at Dollar Tree and made these recording sheet to encourage the kids to make patterns with them! I got these table scatter hearts and knew they would be an amazing manipulative for February. 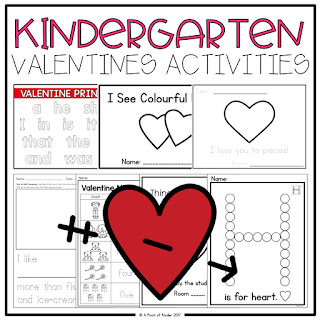 I have used them as loose parts for play dough mats too but this week I realized that I could write on them with a sharpie and make valentine themed letter hearts to go with some of our word work! We are learning digraphs right now so I wrote the letters needed for our digraph read, make & trace sheets and placed them in a basket. I loved that I could write the digraph (e.g. ch) on one heart to reinforce that together it makes a special sound! 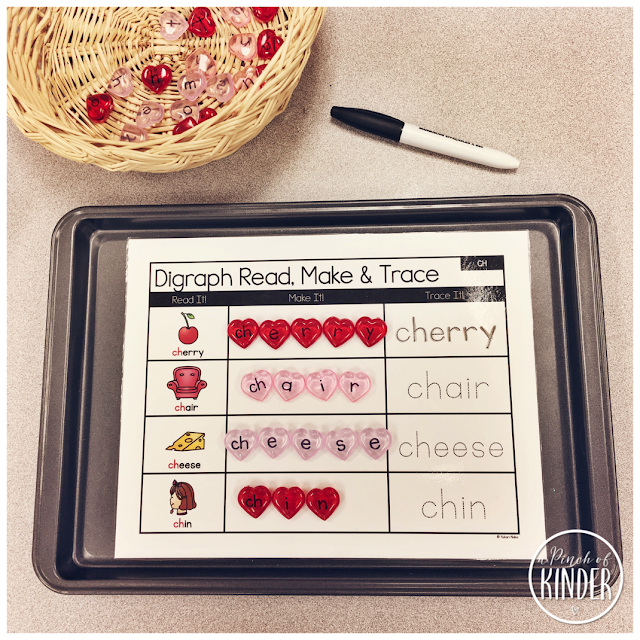 You can find these digraph read, make & trace sheets in my Digraph pack on TPT by clicking here or on the image above. Another oldie but a goodie. 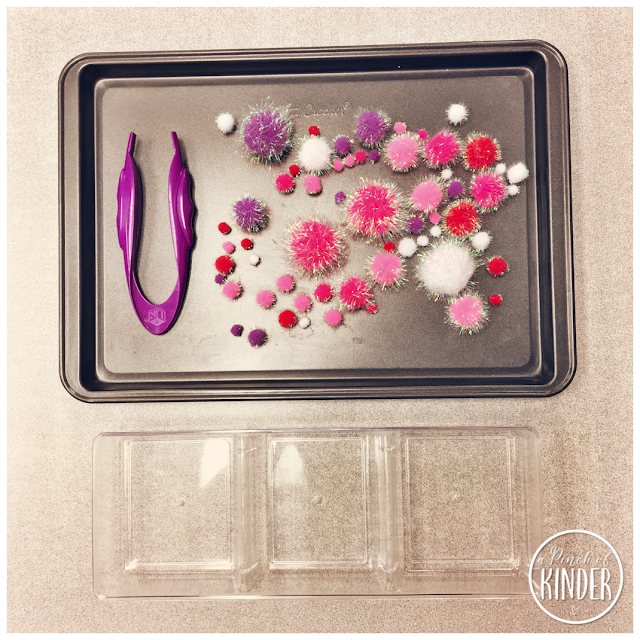 I bought these clear sorting trays at Dollar Tree and they are great for sorting! The tweezers provide great fine motor practice too. I love these pom poms (they are from Michaels) because they come in a variety of colour AND sizes! A lot of my kiddos still need practice with sorting by size so these are perfect! 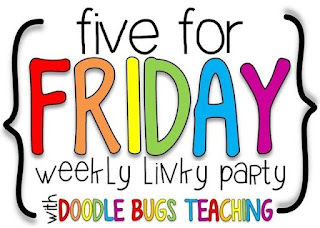 Ok so that's more than five but I'm linking up with Kacey at Doodle Bugs Teaching anyways. If you would like to check out what more teachers are up to, click on the image below to check out the link-up! I hope you were able to grab some ideas for next week! Have a great weekend!